I'm kind of a rare breed. You see I'm half couch potato and half want to be athlete. I'm not quite committed to either all the way. But I decided this year I would try to lean more to the athlete side and by athlete I just mean moving as in running, biking, swimming, walking, just not sitting or eating. 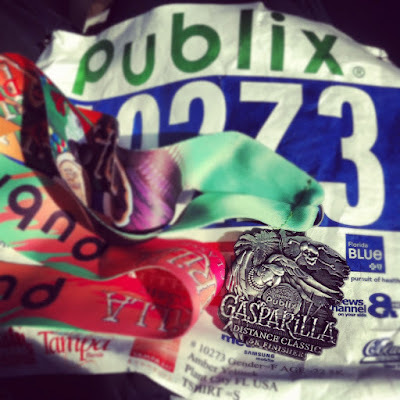 I set my goal of running the Gasperilla 5K which is located in Tampa, FL on the beautiful bayshore which was exactly 10 weeks away from when I set my goal. Then I found a training plan and decided to do The Couch to 5K running plan since it seemed the most manageable to do. It also has an awesome iPhone app which took all the thinking out of the intervals. The little voice on the app told me when to run, when to stop, and when to just keep going. It costs 99 cents but is totally worth it. See how you have that red headed 5K finisher who is your biggest supporter? She's great! I also printed out the schedule and put it on my fridge so I had to look at it all the time and I crossed out each workout I did. It is only 3 days a week so I would say pretty manageable and I could do what it asked me to do! It wasn't super difficult and thought the pace was perfect. I will say it wasn't always easy but I kept thinking if I want to do the next workout I need to get through this one. Building up stamina and endurance isn't pain free either, I was sore the next day often and really had to push myself though some of the workouts. But it is SO worth it!! I can't believe I can get on the treadmill and run for 30 whole minutes now! It really is an amazing feeling. 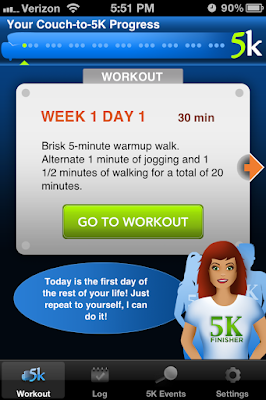 The Couch to 5K program gives you the choice to do your workouts outside or on a treadmill. I choose to do them on a treadmill which I liked since I could track how far I ran easily and exactly how fast I was running. I didn't trust myself to really push myself running outside; on the treadmill I could put the speed at what I wanted and I would have to run or well I would fall off and I try to avoid falling off treadmills. But in 9 weeks I was able to run my first 5K in 36 minutes!!!!! I was and still am so proud! My goal was to just be able to run the entire thing and not stop under 45 minutes and I by far exceeded my goal. Amongst present-day most commonly known creators, Eliza Kors, has got borrowed this abilities that will wrist omega replica sale pieces. Without delay get into character your look at the time you put on amongst this lovely quartz swiss watches. Once examining way structure within the Way Start for Systems during Nyc, Kors started his line of ready-to-wear unique clothings during 1981. She started this path meant for gents during 2002. Once 33 yrs during structure, this things comprise many designer purses that will boots or shoes that will pants - and even this ready-to-wear clothings together with runway chanel replica sale things. Also, Kors may very well be most famous that will hdtv readers as one of the judges over the long-running way process "Project Runway. "Those who want to sports an item with Kors' set should evaluate this line of pieces for girls: Amongst this most cost effective swiss watches stands out as the only amazing Glitz Japanese Quartz Chronograph See. Bright overall bright white, any see consists of bright white resin accessory in addition to a chanel replica chrome steel condition. Most of the bright white has as the wonderful past to your crystals encrusted bezel the fact that traps a person's eye. Any circle chronograph switch games any crystals utilizing silver-tone accessories. Any switch has got a couple of subdials by using a go out with eyeport. Any accessory calculates 6 long longer. Any see is certainly water-resistant as many as 165 your feet.